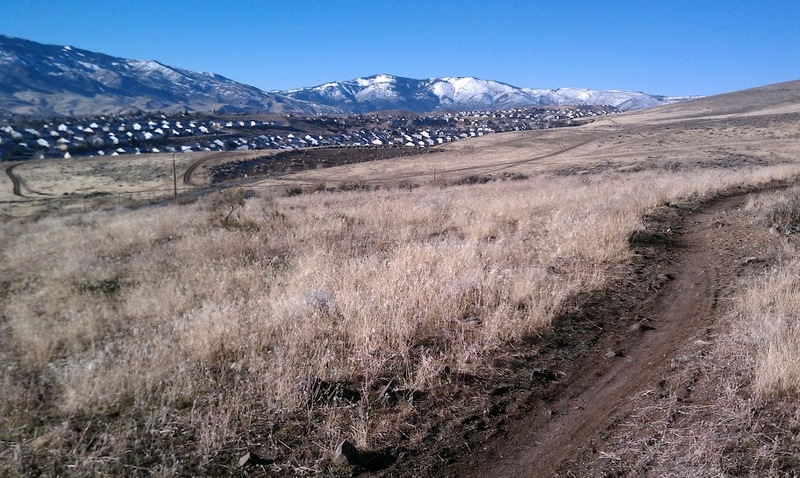 Living in Northwest Reno, we're lucky to have a couple of classic Reno trails right out our back door. 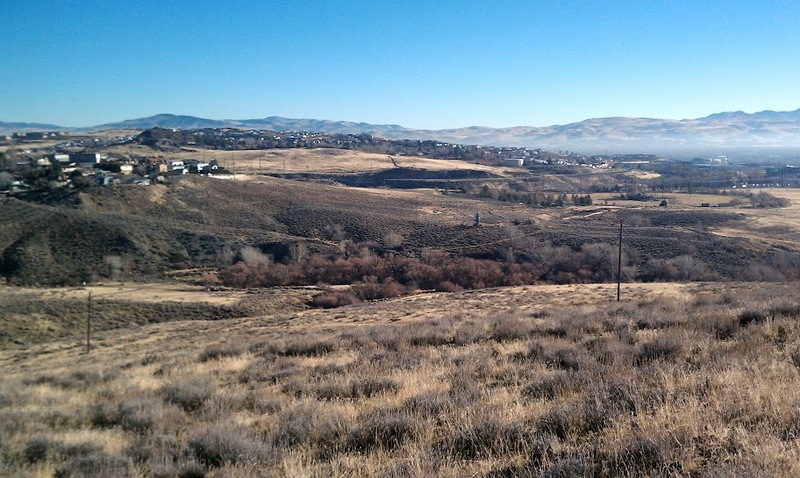 The trail up Keystone Canyon was introduced to me as an old favorite when I first moved here 13 years ago, and the part of Rancho San Rafael extending up Evans Creek Canyon has been very nicely developed during my time here. 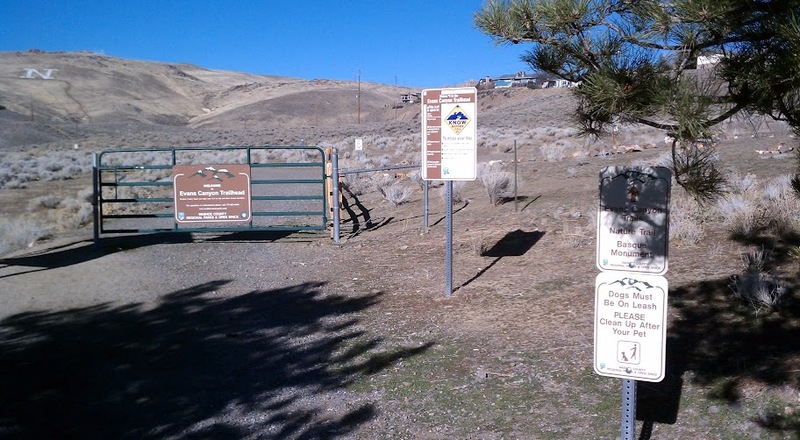 These trails have of course changed over time - sections wash out, abandoned cars appear and disappear, new improvements are made - but they remain popular for their accessibility, challenge and the access they offer to even more trails on the flanks of Peavine Peak. 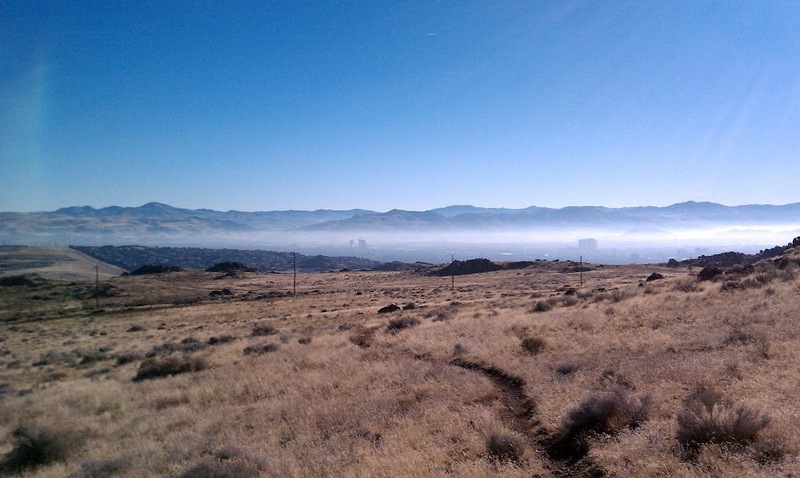 In order to make a loop out of the two canyons, I used to run along McCarran Blvd. from the bottom of Evans Creek Canyon to Keystone Canyon. 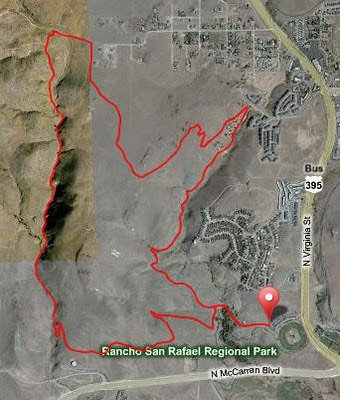 Within the last few years, though, a connecting trail has been built - called, plainly, the Rancho Connector. 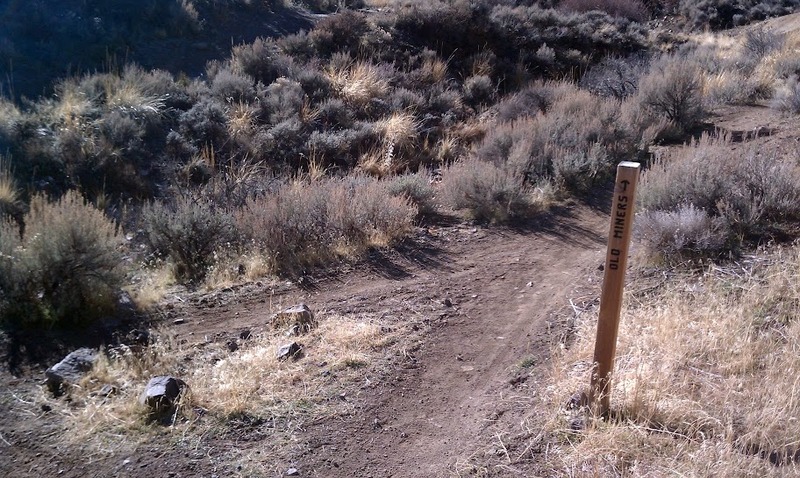 It allows you to stay on singletrack for almost the whole loop between the canyons - about six and a half miles, depending on your exact route. So, here I'm going to lead you through the route that I take. There are many different ways you can run these trails; this just happens to be the way that I prefer it. I like to go up Keystone Canyon because I find it a little easier climb than up Evans Creek, but I know a lot of people like to do it the other way. And there are trails criscrossing the whole area - I'm sure some of them are wonderful, but I've just stayed on ones that I like and am familiar with. So, here's a basic overview of my route. For a zoomable map, visit the Garmin Connect site. 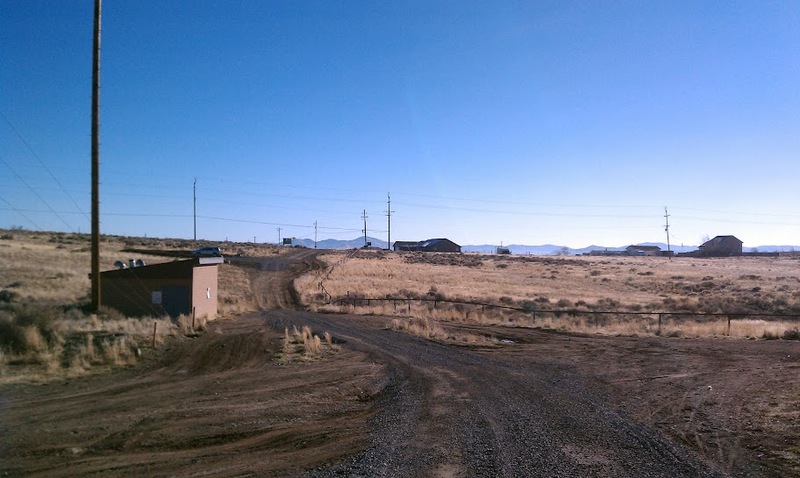 The trailhead is just off the parking lot for the softball fields on the northwest corner of the intersection of North Virginia and McCarran. This is where the disc golf course begins and ends as well; depending on the time of day you may need to dodge a few discs. 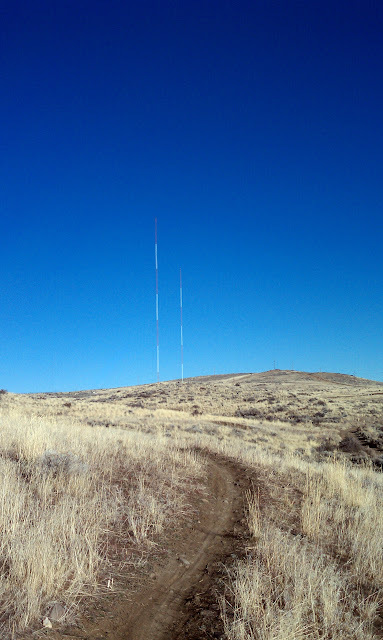 There's a short section of dirt road, which you hop back off of onto some more singletrack, and the a good goal comes into view: the radio towers. A little hazy down there in town, but beautiful up here. At this point the trail starts to get a bit hazy itself. 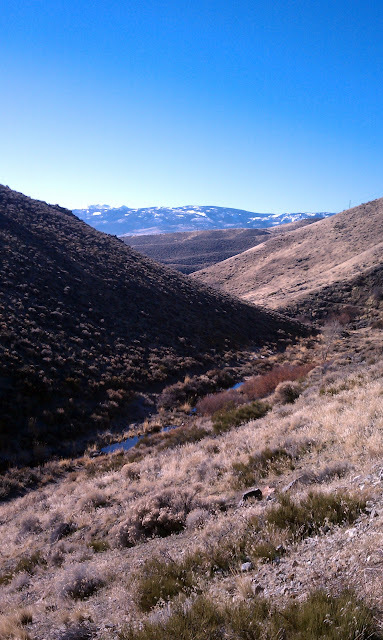 If you stay by the line of telephone poles and to the right of a big grouping of rocks, though, you'll soon be on track and heading eastish towards the top of Evans Creek Canyon. 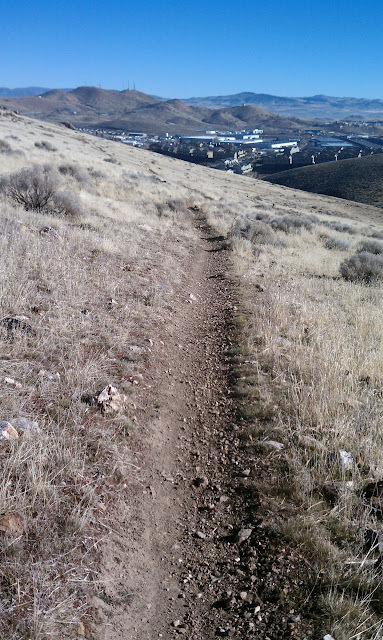 A last couple of rocky climbs and the trail turns right for some long switchbacks down to Evans Creek. A hairpin turn near a housing development sends you flying into Evans Creek Canyon itself. There are trails on both sides of the canyon, but I usually stay on the right (west) side on the way down - here's what it looks like from there. At one point, the trail dips back down near the creek, and you can choose to cross it and take the east side trail back in. I usually opt to take "Old Miners" for a little rocky climb out. 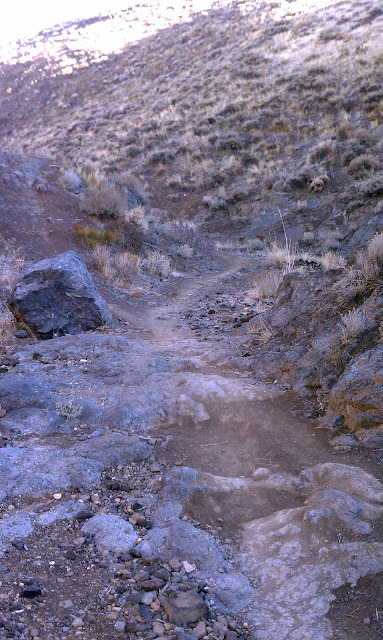 This section takes you just below the UNR "N" on the side of the hill, then back a nice downhill to where you first crossed the creek. 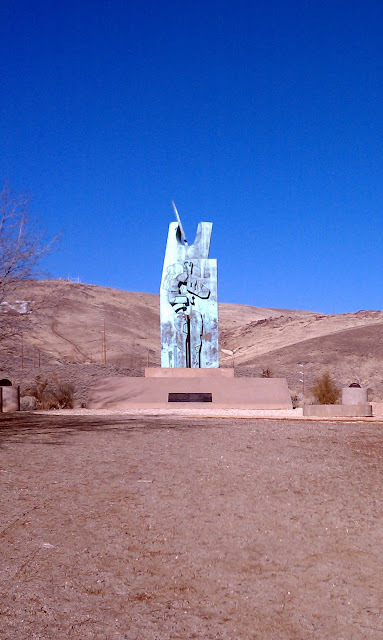 Shouldn't be hard now to make your way past the Basque Monument, dodging frisbees, back to your car. Hope everyone enjoys their runs out ther, and I hpoe to see more and more folks ou on the trails! Slowrunner77 in the back with when he drops me on the hills, though. P.S.--You won the bottle opener contest. Email me your mailing address and your choice of bottle opener and I'll send it out to you later this week. Sections of that trail look very familiar... :) Been WAY too long since TLD has been able to train on some trails together! I know most of those trails by heart and some by face(plant). Is the Halo next? I don't know that one - at least not by that name. Get a hold of me sometime and let's go run it! Did this run yesterday. Beautiful canyons. Had trouble finding the connector trail, and had to do some bushwacking to get to the Keystone Canyon trailhead, but so worth it. Did run into a big coyote at the top of Keystone Canyon which was a little unnerving, but all ended well. Decent into Evans Canyon was so nice. Thanks for posting this! 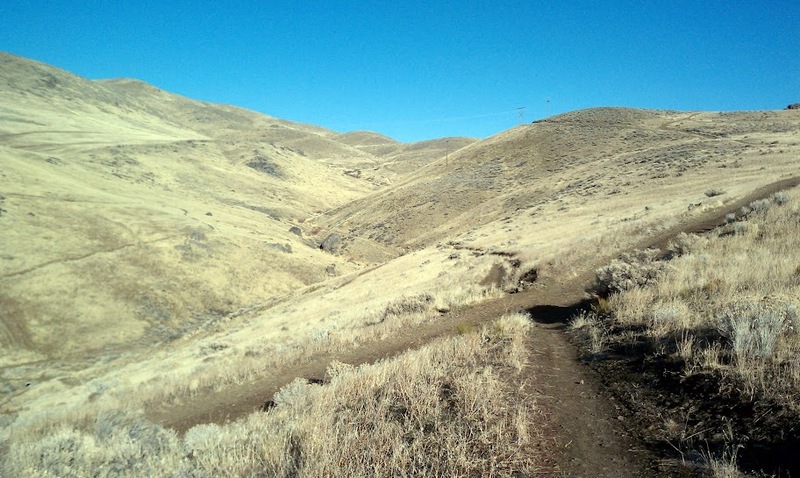 Will be in town this weekend and hoping to run this trail...I see the posts are all older, can anyone tell me if this is still a good trail to use?